There are lots of gymnastics equipment in the market and recent sports persons have a wide range and varieties to choose. Basically gymnastics are taught to children at a very young age when their body structure is more flexible. The very first lesson at the time of initiation is done in balance beams. Balance beams are the primary gymnastic equipment which are learnt by a sportsman. 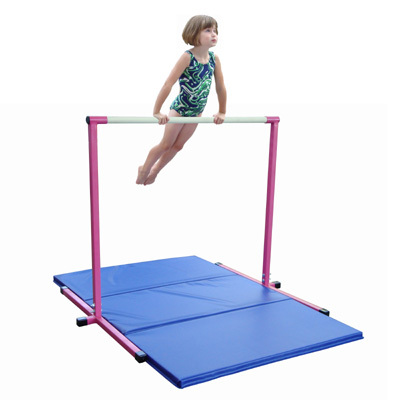 Balance beams are the first equipment used by young gymnastics. There are many types of balance beams such as low balance beam, high balance beam and adjustable balance beams. Low balance beams are used for small children which are of less height so that the children do not get hurt even when they fall from it. This is very safe especially when used by landing mats exclusively available for gymnastics. High balance beams are used at later stages in gymnastic lessons when the person is more trained in the sport. Because if they land hard they may get themselves hurt. High balance beams are to be used strictly under the supervision and guidance of a trained personnel to avoid injury. Adjustable balance beams are those which are flexible and can be adjusted according to one's needs. During a practice session it can be adjusted in a low height and during competition they can be raised to the desired height. There are foldable balance beams also which can be folded while transporting and storing them. All these various types of balance beams are fixed to balance beam braces which are of various heights. These beam braces are also of fixed and adjustable types. Another piece of gymnastic equipment which are very much in use are horizontal bars. There are two types in a horizontal bar, one is of fixed height and stationary in nature and the other is of adjustable type. The height can be adjusted to suit one's requirement in adjustable type. Eat the sweet - beat the fat !